What creature(s) is/are not in the Bible? I think that I know the correct answer, and so I am sharing this image here. 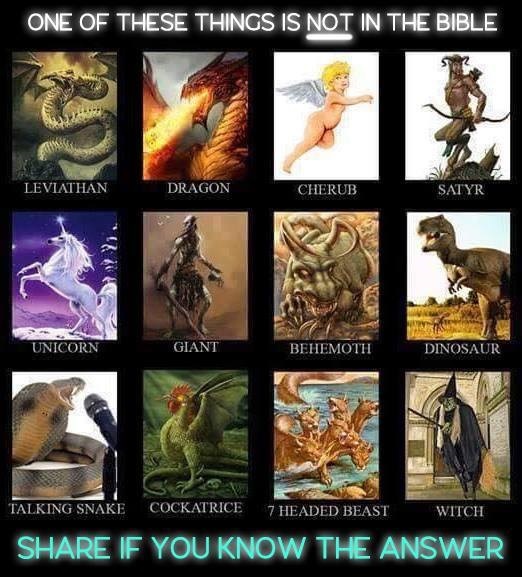 A case can be made that not one but three creatures -- the Cockatrice, Witch, and Dinosaur -- are not in the Bible. At least they are missing from the original Hebrew and Greek texts. 1792 CE when the Roman Catholic Church in Poland executed the last person in Europe who had been tried and convicted of Witchcraft. However, the Church did execute a few Witches into the 1830's in South America. In this passage, the original Hebrew word referred to evil sorceresses who issue negative spells and black magick to harm people or animals. In various passages in the New Testament, "Witchcraft" refers to evil people who use poison to murder others. Many modern translation use "sorcerer" but this is also an ambiguous term. Today, "sorcerer" sometimes refers to people who simply use positive, non-manipulating and non-controlling spells and magick; alternately it may refer to persons who use black magick to do harm. "An' it harm none, do what ye will." "Do whatever you wish as long as it doesn't harm anyone, including yourself." In the Bible they refer to people who use black magick to kill or injure people and animals. In common experience today, "Witch" refers to a follower of a Neo pagan religion who is specifically prohibited from injuring or even manipulating others. The Dinosaur: Most students of the Bible believe that there is no biblical mentions of this animal. Most conservative Christians believe that God created the dinosaurs as one species when he created all the land animals on the fifth day of Creation. (Genesis 1:20 to 23), at some time after 8000 BCE -- perhaps on 4004 BCE. Some believe that a pair of dinosaurs did not make it into the ark. Thus, they drowned and did not survive the flood of Noah. Others believe that a pair of dinosaurs survived in the flood, but the species died out later before modern times. However, some followers of Abrahamic religions interpret Job 40:15 to 24 as referring to dinosaurs. "15 "Behold now behemoth, which I made with thee; he eateth grass as an ox." A few translations like the Amplified Bible, Classic Edition (AMPC), Contemporary English Version (CEV), The Living Bible (TLB), New Life Version (NLV), and the Orthodox Jewish Bible (OJB) render use the word "hippopotamus" instead of "behemoth." When most people think of dinosaurs, they recall horrendous rows of teeth for tearing other animals apart. However, there were also dinosaurs that were herbivores and ate grasses and other plants. So, Verse 15 might refer to a dinosaur. "17: " He moveth his tail like a cedar ..."
Dinosaur tails looked more like switches than the trunk of a cedar tree. So, it would be a stretch to say that Job 40 refers to dinosaurs. Beliefs about origins of the universe, the Earth, and its life forms. Downloaded from Wikipedia at: https://en.wikipedia.org/ CC SA 1.0. Dated 2004-JUL-29. 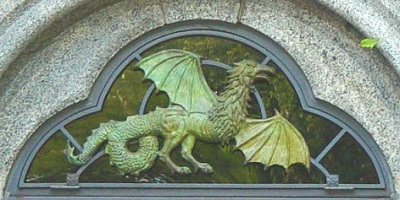 Original by Leonard G. It is a photograph of a door at Belvedere Castle, built in 1869, in New York City's Central Park.